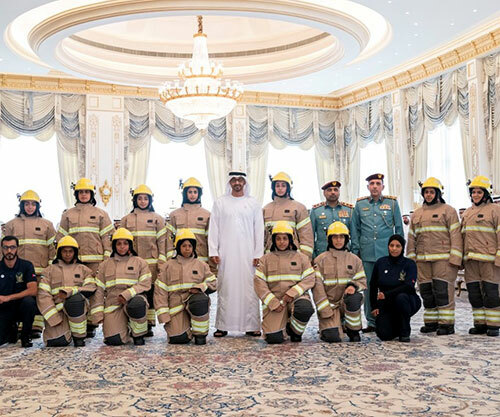 “The UAE woman is always proving her worth in performing all the national tasks assigned to her, excelling herself in fulfilling her responsibilities and meeting her obligations,” Sheikh Mohamed told the Emirati firefighters after congratulating them on their graduation from the course. “The UAE, under the leadership of President His Highness Sheikh Khalifa bin Zayed Al Nahyan, set women’s empowerment on top of the country’s national priorities, with women now being true partners and contributors to the national developmental drive and strategic plans for the nation's present and future,” he continued. The graduates expressed their appreciation for the paramount concern paid by the country’s wise leadership to Emirati women and hailed the support provided by the UAE President and Abu Dhabi Crown Prince for empowering women across all walks of life, according to Emirates News Agency WAM. Attending the meeting were H.H. Sheikh Tahnoun bin Mohammed Al Nahyan, Abu Dhabi Ruler’s Representative in Al Ain Region, H.H. Sheikh Sorour bin Mohamed Al Nahyan, H.H. Issa bin Zayed Al Nahyan, H.H. Sheikh Nahyan bin Zayed Al Nahyan, Chairman of the Board of Trustees of Zayed bin Sultan Al Nahyan Charitable and Humanitarian Foundation, H.H. Lt. General Sheikh Saif bin Zayed Al Nahyan, Deputy Prime Minister and Minister of the Interior, H.H. Sheikh Khalid bin Zayed Al Nahyan, Chairman of the Board of Zayed Higher Organisation for People of Determination, ZHO, Sheikh Nahyan bin Mubarak Al Nahyan, Minister of Tolerance, and Sheikh Hamdan bin Mubarak Al Nahyan. The training features hands-on exercises to enable the participants master new skills in addition to group activities to create social involvement, allow full participation, encourage team building and simulate a real world workplace along with the key safety domains.